Spring has Sprung, so why not Bike to Work on May 28? Join hundreds from across Hamilton and the Toronto Area as they bike to work as part of the annual Bike to Work Day! A number of great prizes and giveaways for participants, including a regional grand prize! Be sure to check back regularly as details are released throughout April. Registration will open in early May. 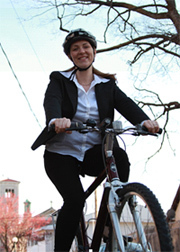 Will you take the pledge to Bike to Work on May 28? To learn more visit the Smart Commute Website.